Koi (Cyprinus carpio carpio) are a common sight in ornamental ponds around the world. They represent good fortune and luck in many cultures and are sometimes referred to as living jewels. Koi are the domesticated form of wild Asian carps. The processed was begun in the 1800’s when fish that showed more gold coloring than others were pulled from fisherman’s net and put into ornamental ponds. By the 20th century many of the recognizable color patterns were firmly established. Koi come in combinations of yellow, orange, red, black and white. 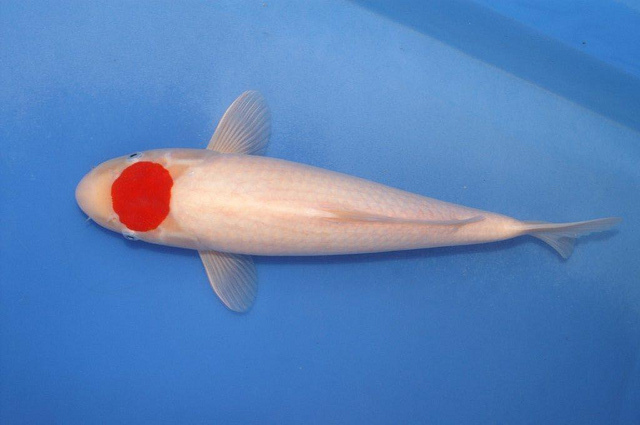 One of the most common color patterns is a simple white and red koi. This is called kohaku. A kohaku koi with a single red patch on its head is called a tancho and is highly prized because they resemble the Japanese flag as well as the sacred tancho crane. Some tancho koi sell for over a thousand dollars. As beautiful as they are, koi are not for the everyday hobbyist. They are large fish that require large tanks or ponds. The average size of a properly cared for adult koi is over a foot (30 cm) long. When given enough room and good food, champion koi will reach almost three feet (91 cm) long. Like goldfish, they are also copious producers of ammonia. A fish of this size and dirtiness cannot be housed in a normal sized tank. I don’t recommend anything smaller than 500 gallons (1,892 L) for a single koi. I know other people would choose to keep them in smaller tanks, but I feel it would not give the fish enough room to reach its full potential. There are a few different ways to stock a pond. Some koi hobbyists have heavily stocked ponds with professional-grade filtration systems and do large weekly water changes. Some, like myself, chose a more relaxed approach. I only have one fish per 550 gal (2,082 L) of water. This lower stocking level means I don’t have to spend as much on equipment and maintenance. As with a lot of fish, there are a few right ways to stock a pond and most of it depends on how much money and time you want to put into it. But there is one certainty with koi: they need large ponds. Koi are a hardy pond fish with a wide temperature range. They can survive in water that is almost below freezing or up to tropical temperatures. The important thing is that they experience these transitions gradually. In a large enough pond there is little worry of temperatures changing drastically overnight; this is another reason to keep koi in large volumes of water. The generally accepted range of temperature tolerance for koi is 35F (2C) to 85F (30C). I highly recommend putting a thermometer into the pond because air temperature and water temperatures can differ greatly. 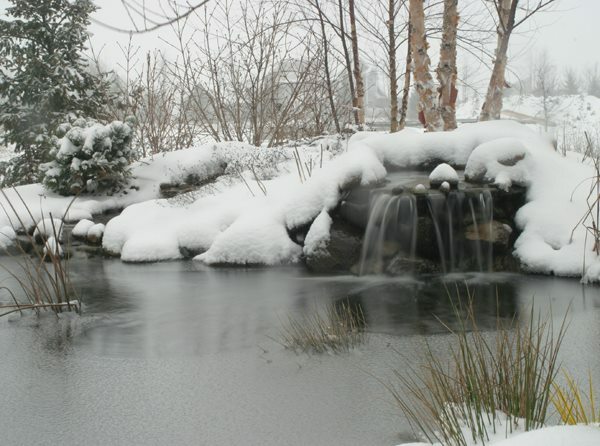 The depth of a pond plays a large role in temperature control. The deeper the pond is, the cooler it will be in the summer and the warmer it will be in the winter. This may seem counter-intuitive, but the ground acts as insulator against both the cold and the warm. It is this same principle of insulation that keeps caverns the same temperature year-round. The farther north you live, the deeper you will need to dig your pond in order to prevent it from freezing solid in the winter. In the southern US you may only need to go down 2.5 feet (76 cm), but in Ontario, Canada you may have to dig down 5 feet (1.5 m) deep. Just because koi are hardy doesn’t mean that water quality isn’t important. If you want to grow large and beautiful koi, clean water is a must. Just like with tanks, koi need filters and water changes. The filters on ponds are large and scaled to the pond, but just like tanks they will need some kind of regular maintenance, whether it is professionally done or your own labor. I clean the debris out of my filter about three times a year: once when I take the leaf net off in the spring; once in the summer; and once in the fall before I put the leaf net on the pond for the winter. Because ponds are located outside we get assistance from Mother Nature with water changes. Unless you live in a desert climate, water changes are taken care of for you. When it rains, the fresh water enters the pond and causes it to overflow (most ponds have directed overflow drainage that also protects the fish from getting swept out). When the pond overflows, the older dirty water flows out and is replaced with the incoming fresh water. These pond overflows can also provide a nice area to plant a bog garden. Koi, like goldfish, are omnivorous fish. Because they are subject to large temperature changes throughout the year, their diet has to change with the seasons. Fish are cold-blooded which means their ability to digest food is dependent on the outside temperature. In cool weather they cannot handle protein-rich foods; if fed too much it can rot in their digestive tract and kill them. For this reason there are two general types of koi food sold: warm water food and cool water food. At temperatures above 65F (18C) koi should be fed a staple food, sometimes called summer feed. This is food with a higher protein content, usually above 35%. Koi metabolisms work fast enough at these temperatures to digest proteins. This is when most growth occurs. As the temperature increase, you increase both the volume of food and the frequencies of feeding. Below 65F (18C) koi should be fed a wheat germ-based food. Below 65F (18C) the koi metabolism slows and cannot handle high proteins, but until the water reaches 50F (10C) koi still need to be fed. This high-carb food is easy to digest and helps them gather enough energy for winter hibernation. As the temperature decreases you lower the amount and frequency of feedings until you are only feeding once every couple of days. Below 50F (10C) your koi should not be fed. They are in hibernation. If the temperature warms slightly in the winter, they will graze on algae and detritus in the pond. I have included below the temperature feeding schedule I use for my koi. There is some debate about the exact temperatures among koi hobbyists but this is what has worked for me. Every day. As much as they can eat in about 10 minutes. Feed 3 – 4 times a day. Every day, twice a day with a staple food. Every day, once a day (mix of wheat germ and staple). Midday feedings are best. This is more of personal preference than koi preference. Koi thrive in bare-bottomed ponds, gravel-bottomed ponds, and mud-bottomed ponds. Bare-bottom ponds are easier to keep clean. Most serious koi hobbyists use these types of ponds because it enables them to keep the water crystal clear to grow massive koi. Some Japanese water gardens use mud bottom ponds because that is traditionally how koi were kept. Koi breeders who breed the traditional way use mud bottom ponds as spawning sites. The downside to mud-bottom ponds is that koi like to root around in the substrate, and the stirred-up mud obscures your view of these gorgeous fish. I prefer a light layer of large gravel over the pond liner as it produces a natural look without the cloudiness of mud. Koi, like most carps and minnows, are social fish. They prefer the company of their own kind but also do well with goldfish (Carassius auratus auratus), golden tench (Tinca tinca), channel catfish (Ictalurus punctatus), and golden orfe (Leuciscus idus). Sturgeon (Acipenseridae) do not make good pond-mates for koi because they are shy and require a carnivore-based diet. Koi should not be housed with fish that will fit in their mouth because they can and will eat the smaller fish. 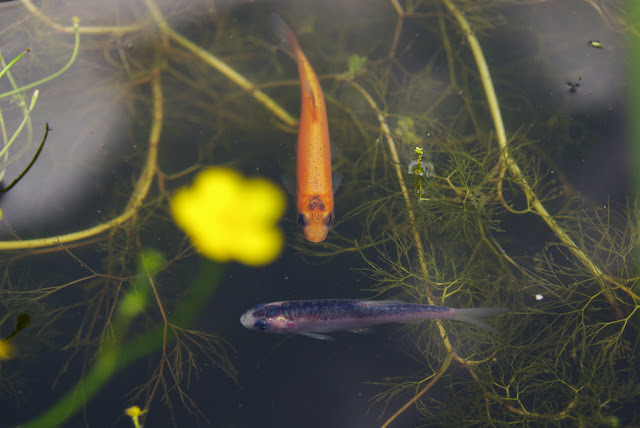 While guppies (Poecilia reticulata) would look pretty in with your koi, they will likely become snacks. Koi, like goldfish, are notorious for eating plants in ponds. Most people don’t keep floating or submerged plants in koi ponds for this reason. However, marginal plants, bog filters, and waterfall filters are very popular. Not only do they add an aesthetic beauty but they also help keep the water clean. 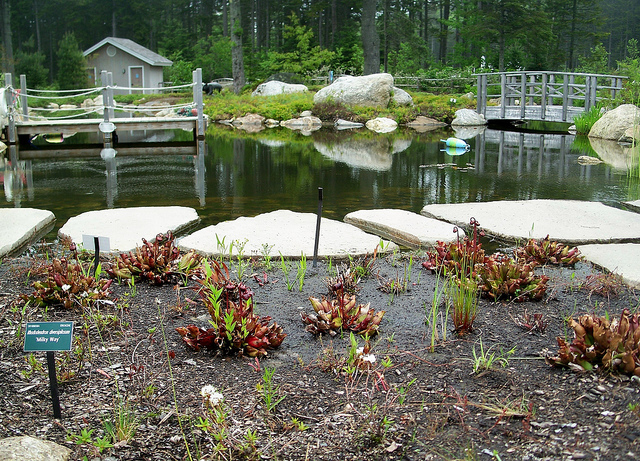 Marginal plants are placed on the edge of the pond so that just the roots are in the water. There are two types of marginal plants: hardy and tropical. Hardy marginals can survive through the winter in most places but tropical marginals cannot (unless you live in a semi-tropical climate). Most of these plants need a decent amount of sun, so in my mostly shaded pond I can only grow a few marginals. I maintain a number of yellow flag iris (Iris pseudacorus). Tall marginals like cattails (Typha spp) and arrowheads (Sagittaria spp) should be placed on the far side of the pond so as not to obstruct your view. Low-growing marginals like marsh marigolds (Caltha palustris) should be planted on the side of the pond where you will be viewing the pond most times. Marginal plants can also be put into a bog filter. This is a separate area of the pond that the koi cannot reach. It will only have about 6 inches of water which enables the roots to stay wet. This water comes from the koi pond filled with nutrients for the plants. The plants remove the nutrients generated by the fish and the cleaned water is returned to the pond. 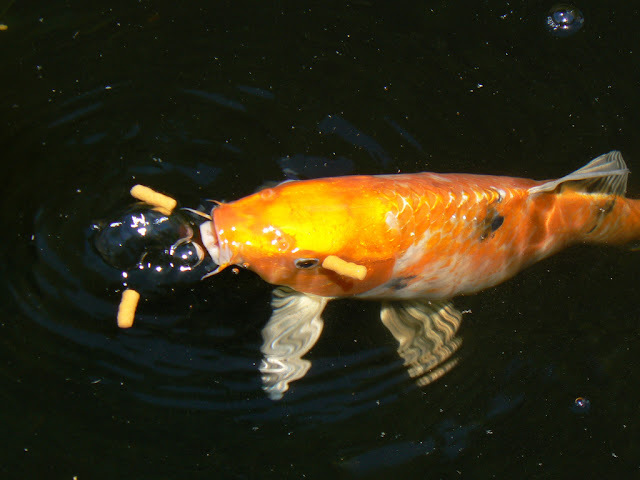 Some people who have koi that even eat the roots find this a wonderful way to introduce plants into the system without having to worry about them becoming a koi snack. Another way koi-keepers can sneak plants into a koi pond is with a waterfall filter. The water return at the top of the waterfall of a koi pond is often an open-top barrel. Some people (including myself) use this space to grow plants. You can use floating plants like water hyacinth or marginal plants, and I’ve even seen people grow veggies hydroponically there. Koi are renowned for their longevity. The average lifespan of a properly cared for koi is between 20 and 35 years, but there have been some special cases that long surpassed that average. In a small, creek-fed pond in Gifu, Japan there were six fish that far surpassed that average. Hanako, a scarlet koi, was the oldest of the lot. She was hatched in 1751. To put that in historical perspective she hatched 25 years before the Declaration of Independence was signed. This was verified by Prof. Masayoshi Hiro, D.Sc., Laboratory of Domestic Science, Nagoya Women's College. She removed a scale from Hanako’s body and counted the growth rings under a microscope, much as you would count the growth rings of a tree. 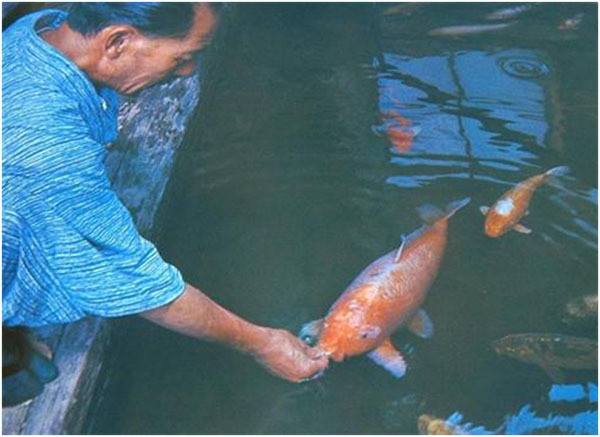 In 1966 when the interview with Hanako’s owner was aired on radio, the other koi in the pond were 170, 155, 151, and 141. Unfortunately Hanako is no longer alive today. She died July 17, 1977 and was 226 when she died. All over the world, koi symbolize luck and fortune, but most people don’t know the reason why. An old Chinese legends hold that long ago the supreme god of the heavens called the Yellow Emperor became displease with the humans for their evil ways. He ordered the rain god to flood the earth to destroy the humans. Kun, the Yellow Emperor’s grandson was distraught by the destruction and pleaded with his grandfather to spare the humans. The Yellow Emperor did not relent, so Kun stole some “magic mud” from his grandfather’s treasure. Kun sprinkled this mud and as it hit the water turned into land where the humans could take refuge. Furious at his grandson, the Yellow Emperor sent the fire god to kill Kun who tried to disguise himself as a white horse, but the fire god saw through it and struck Kun down. After many years of continued flooding a golden dragon named Yu emerged from the white horse that was once Kun. He flew to the heavens to plead with his great-grandfather to stop the flood. This time his perseverance paid off, and the Yellow Emperor told Yu to take the magic mud and make land again. Yu easily carved a river through the soft mud, but when he came to rocky cliffs he had to greatly increase his effort to dig out a gorge. In doing so he created huge waterfalls hundreds of feet high. He declared the waterfalls sacred to dragons. The river eventually became known as the Yellow River and those 12-mile long gorges located in China’s Shanxi province became known as Dragon’s Gate. Every spring thousands of koi swim up the Yellow River and if they have the skill and perseverance of a dragon to climb the falls they become dragons themselves. Because of this legend, koi are symbols of hard work, patience, and skill which are all things needed to have good fortune in life. Taking care of koi isn’t always an easy task, but just like Yu and the Dragon’s Gate waterfalls persevering through the hardships can make the final outcome that much more beautiful. "Frequently asked water gardening questions." Crystal Creek Pond Supply LLC. www.pondkoi.com. Updated: 8 May 2013. Retrieved: 8 June 2013. "Koi Encyclopedia." Pan Intercorp. www.koi.com. Updated: 8 June 2013. Retrieved: 8 June 2013. "Legend of Dragon's Gate." www.foolonthenet.blogspot.com. Updated: 8 November 2010. Retrieved: 7 June 2013. "The Story of Hanako." Koi.net. www.playkoi.com. Updated: 29 January 2013. Retrieved: 8 June 2013. "Temperature." Koi Club of San Diego. www.koiclubsandiego.org. Updated: 7 June 2013. Retrieved: 8 June 2013. **Disclaimer** Since there is little to no scientific research about fishkeeping published, much of the hobby today is opinion, but they are opinions given by keepers and breeders who have been doing this longer than some of us have been alive. Temperature ranges and adult sizes are not opinion. They have been scientifically documented. Very well put and informative! Thank you for sharing. Thanks for the article - i regards to the food are there any specific brands of pond food that you'd recommend for Carps? As far as brands go, it depends on what you want from your fish. If you're looking to grow monsters then Hikari or Dainichi are great. They offer some great grow foods. I just have pet fish, so I tend to use something that isn't as expensive but still of a good quality. Drs. Foster and Smith makes a good food. The important thing (like with any fish food) is to look at the ingredients. For a summer food you don't want wheat to be at the top. You want good protein like fish and krill. I also like to have garlic in my spring/fall feed. This is a beautiful and informative blog about the pond care and maintenance. Your effort is appreciative as the contains are put very well. This blog is really worth. Wow! These information are quite interesting. Anyway, do you use Pond Dye? We just bought one for our Pond to improve its appearance. Hello, how many inch will the kois grow per month? also how to distinguish a good skin for 4 week old kois? I agree that koi are not for the everyday hobbyist. 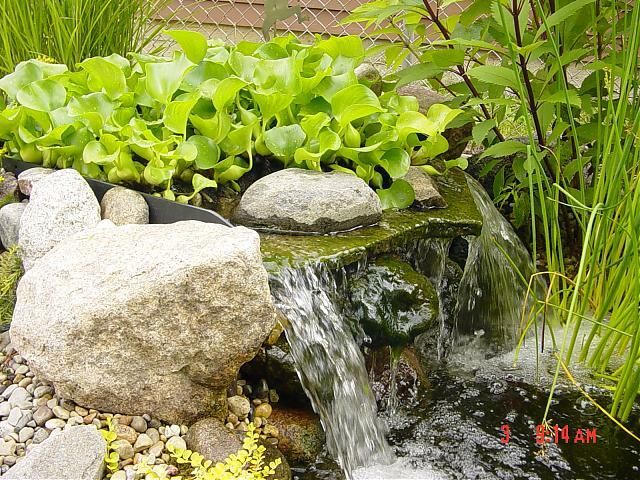 However, Koi Ponds can be a great addition to your home or business. I enjoyed learning about the life span of koi fish, how cool would that be to own a fish that can out live most of your neighbors pets.